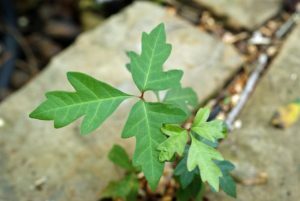 How to get rid of poison ivy? : Did you know why you end up with a nasty rash when you brush against a poison ivy creeper? Poison ivy and its cousins – the poison sumac and oak, have urushiol oil, the culprit behind that wretched rash. Thankfully, there are a number of remedies that can come in handy when you face a close encounter with poison ivy or its not so friendly cousins. Read on for simple yet effective remedies that can be used to get rid of poison ivy. A few slices of cucumber are all you need to get rid of poison ivy. It is hands down the simplest poison ivy remedies that you can find. Place a few slices of cucumber in the refrigerator. Once they have cooled, place them on the affected area. You may also blend some cucumber slices to make paste and apply it generously on the rash for instant relief from itching and burning that accompanies the rash. Also check: How to get rid of warts? If the cucumbers did not work, try banana peels. Rubbing the insides of a banana peel on the affected area can give you considerable relief. Do not brush this remedy away thinking it is an old wives tale. This is a treatment that may people swear by and is certainly worth giving a try. Must read: How to get rid of chigger bite? ACV has been used since time immemorial in treating myriad health conditions. And, yes you can also use a few drops of this potent tincture to treat poison ivy rash. All you need to do is soak a brown paper bag in ACV and place it on the affected area. This will help draw out the toxins and give you immense relief. If you have red blisters that refuse to abate, try baking soda. Mix about 3 teaspoons of baking soda and 1 teaspoon of water in a bowl. Make a consistent paste out of these and apply it to the affected areas. Once it has dried up the powder will flake off on its own. Repeat this a number of times till the blisters reduce. If your blisters are oozing, try another remedy. Mix about 2 teaspoons of baking soda in a quart of water and dip sterile gauze pads in it, gently dab onto the affected areas. Repeat it for about 10 times, at least four times a day. Be sure to not let this get into your eyes. You can alternatively soak in a cool bath of baking soda for immediate relief. If the thought of soaking in a tub of baking soda doesn’t appease, try oatmeal. Take a cup of oat meal and grind it in your blender till it turns into fine powder. Pour this powder into a clean piece of cheese cloth or simply stuff it into a stocking. Knot it up and tie it onto the faucet of your bathtub. Be sure that the bag remains suspended under running water. Now, fill the tub with lukewarm water and enjoy a soak for half an hour. You may also directly apply the pouch to the rash if the blisters are severe. Also check: How to get rid of heat rash? Just as how it treats a nasty sun burn, aloe vera can also do the same with poison ivy rashes. Use freshly extracted gel from an aloe leaf and apply it generously on the rash every four hours. If you cannot lay your hands on aloe leaf, aloe gel purchased from pharma works as well. This is more of a preventive measure than a remedy in itself. But, it is worth implementing. After, a stitch in time saves nine. If you know that the area you are about to head to may have poison ivy, carry some rubbing alcohol along with you. Immediately after contact, swipe some on your skin to slow down and minimize discomfort. Rubbing alcohol will inhibit urishiol in poison ivy from penetrating deep into your skin. Also check: How to get rid of cradle cap? A few drops of lemon juice is all your need when you have to get rid of poison ivy. People from across the globe swear by the many benefits of this juice. As a natural astringent, lemon juice does not allow the plant’s oil to get into your skin. Apply a few drops of lemon juice soon after your skin comes in contact with poison ivy. Must read: How to get rid of keratosis pilaris? Simply washing the affected areas in cool running water and a mild soap soon after contact can reduce the size and severity of the rash greatly. So put your hand or affected area under cool, running water for a few minutes if you happen to brush into poison ivy. DO NOT use hot water, as it can irritate the skin. Every time you feel the rash flaring, use a cold compress. This will help tame the itchiness and prevent you from scratching, which can prevent blisters and infection. You may use either a cloth dipped in cold water or bundle some ice in a clean cloth for this remedy. Must read: How to get rid of blisters? Follow up the cold compress with a round of witch hazel application. This potent herb will give you instant relief from a weepy poison ivy rash. Brew a cup of witch hazel tea and allow it to steep. Strain and let the mixture cool. Once the mixture has cooled, use a clean cotton ball dipped in the concoction. Apply this to the affected area and let it air dry. Repeat as and when you need. These simple remedies have been tried and tested. Those who have used it will swear by their efficacy. Remember, that these remedies may not work instantly and you may need to use a combination of one or two along with an anti-allergen, but you will soon see those rashes subside like they never existed. How to Get Rid of Toenail Fungus with Easy Home Remedies?